18-Mar-2019 - DiskPulse v11.7 adds the ability to display timeline charts showing the number of changed files and the number of changed disk space per hour. In addition, the new product version adds the ability to export all types of pie charts and timeline charts to the BMP, JPEG and PNG image formats. Finally, the new version improves the main DiskPulse GUI application and fixes a number of bugs. 21-Feb-2019 - DiskPulse v11.6 improves the SQL database reports, improves the file matching rules allowing one to monitor specific types of files by the file name, directory name, file type, file attributes, file size, etc. In addition, the new product version improves the main DiskPulse GUI application and fixes a number of bugs. 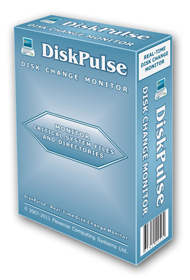 28-Jan-2019 - DiskPulse v11.5 adds the ability to search disk changes by the change time, adds the ability to categorize and filter disk changes by the change hour and improves all types of summary disk change monitoring reports. In addition, the new product version improves disk change monitoring statistics pie charts and fixes a number of bugs.